The 2013 newly built cottage offers 100m² living space on the ground floor a kitchen with a comfortable sofa and fireplace (access to the furnished terrace), a bedroom with 2 single beds and a bathroom shower / WC. On the upper floor are 2 bedrooms (1 double bed, 2 single beds), a bathroom shower / WC and living area with sitting or TV corner (access to the balcony). Underfloor heating contributes to the well-being in the cold season. All bedrooms have insect repellent. Wooden barbecue and garaging for bicycles in a lockable shed. The property is fenced. Holiday in the Mecklenburg Lake District. 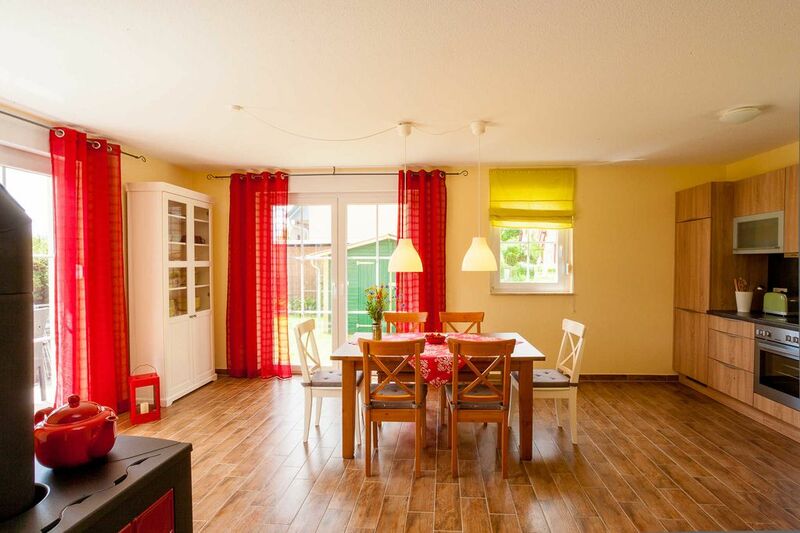 The 2013 newly built, spacious holiday home is located in Untergöhren near the Flesensee. Cycling and hiking tours in the nature reserve, play golf on one of the most beautiful golf areas in Germany (three 18-hole and two 9-hole courses), the Fleesensee SPA in Göhren-Lebbin and the visit of charming places in the vicinity (Waren, Malchow) make Your vacation an experience. Our house is family friendly. Sehr schönes Haus, gute Lage! Das Haus ist sehr sauber, komfortabel ausgestattet und geräumig. Parkplätze für 3 Autos durch nebenliegendes freies Grundstück unproblematisch. Kontakt zum Vermieter war super und unkompliziert. Gerne wieder! Geräumig, sauber und sehr gut ausgestattet. Das Haus ist gross und gut geschnitten. Die Küche und das ganze Haus sind gut ausgestattet. Auch Liegen, Grill, alles in der Küche was man braucht. Es ist sehr sauber. Wir haben uns mit 2 Kindern und 4 Erwachsenen wohlgefühlt. Zum Wasser sind es nur ein paar Minuten, zur Badestelle mit Kinderspielplatz am Wasser entlang ca. 1 km. 2 Autos finden Platz. Enjoy in every season in Untergöhren (Göhren-Lebbin) on Fleesensee the unique holiday region of the Mecklenburg Lake District in our house. Quietly located, it invites you to relax, to ride a bike on well-developed networked paths, swimming and leisure activities at the 200m distant well-laid beach. The nearby spa provides spa services. Numerous destinations such as Bear Forest etc. can be found in the area. The landing stage of the Müritz fleet is on site.